If you have Degenerative Disc Disease and Fibromyalgia, it is important to utilize the most effective but least invasive options to treating lower back pain. 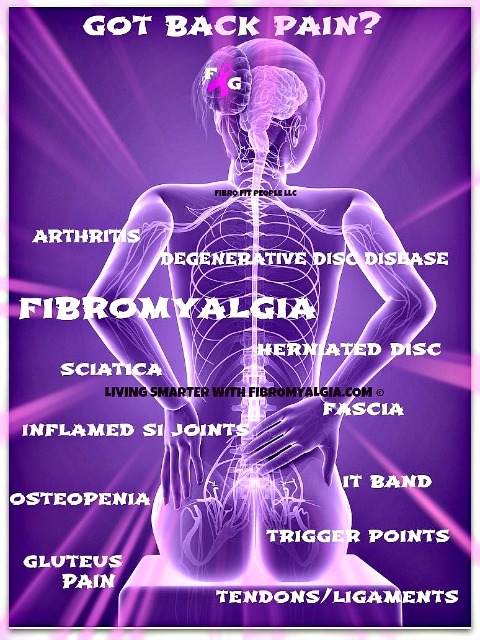 And like fibro, it can feel progressive, however many experts on treating back pain believe that degenerative disc disease is more of a waxing and waning pain syndrome due to normal wear or aging and not really a "disease"
With fibromyalgia, we are more "sensitive" to any kind of injections. If you choose treatments including injections such as epidurals, cortisone or even saline/cartilage injections, it is important to know that the fibro body will likely need more recovery time from the injection sites. That is normal for a fibro patient. However, doctors treating other conditions in a fibromyalgia patient will not always know this. We have also found techniques utilizing inexpensive tools that can be used at home. One such tool is a small curved padded device that can aid in de-compression while lying comfortably on the floor or even on a raised table. 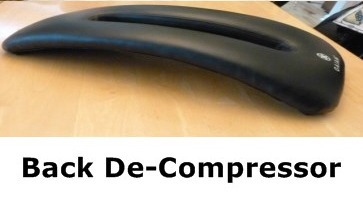 Available here on this link, this device is called the 'back wave'. While utilizing any kind of de-compression, it is important to be very relaxed while 'allowing' the entire spine to release. It might not feel normal at first. Start with 1-2 minute increments and work up to 5-10 minutes per session. An inversion table can also be used for spinal de-compression either at home, at the gym or in the doctor's office. Go slow when using inversion, especially with any active trigger points in the neck or back area. It has been found that even going just past 50% on the table can be helpful, so going slow and adjusting to the feeling of being inverted needs to be a consistent process. I will provide another caution with inversion, but this won't be an issue until you are going past about 70% inversion. If you have weakness in your ankles, you want to be sure to not only wear shoes while inverting, but also thick socks may be helpful and if you feel too much pressure on the ankles, then come back up as much as needed. For chronic pain management, it is really essential to get the blood flowing around any painful areas of the fibro body by following my "fitness protocol" (fibromyalgia-exercises) and taking a moderate walk before engaging in other activities of daily living. Avoid prolonged sitting during the first part of the day .. I've discovered a new tool for my constant lower back pain which is one of my most troublesome areas of chronic pain; its called the Lo-Bak Trax. I've been using this for a few weeks and its helped a lot. I love it. Click on the links and wander on over to Amazon and check it out.